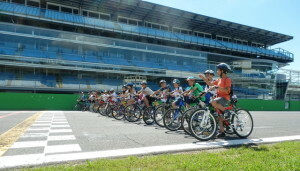 Autodromo area, Italian Grand Prix track, High Speed track, Monza Park: storied places to discover throughout its exclusive itineraries riding a bicycle. A mix of sport, cultural heritage and nature to experience with the support of our bike Guides cycling around the green areas. Bike excursions different in duration, length, all paths to taste with no hurry, how only by bike you can feel. Note: Booking for all activities is required. Track, areas and buildings availability is subjected to motorsport activity and technical needs.